Transfers to and from the lodge airstrip. Wonderfully attractive lodge combining clean, modern lines with the warmth of natural building materials like the polished wooden floors and stone-clad walls – add in stylish contemporary décor objects and the lodge’s signature green colour palette and it adds up to one of the most attractive lodges around! 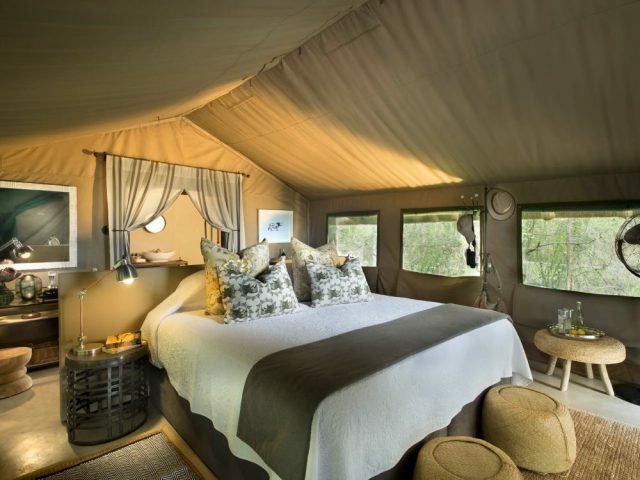 The tented suites are a great blend of contemporary design with the unique closeness to nature that only sleeping under canvas can deliver – as you lie awake in your massive bed listening to the sound of lions roaring into the night through the canvas walls of your tent, you’ll feel like a modern version of the safari explorers of old! Dining by lamplight under the stars on the sands of the dry river bed in front of the lodge – it’s hard to see how things can get better than this! 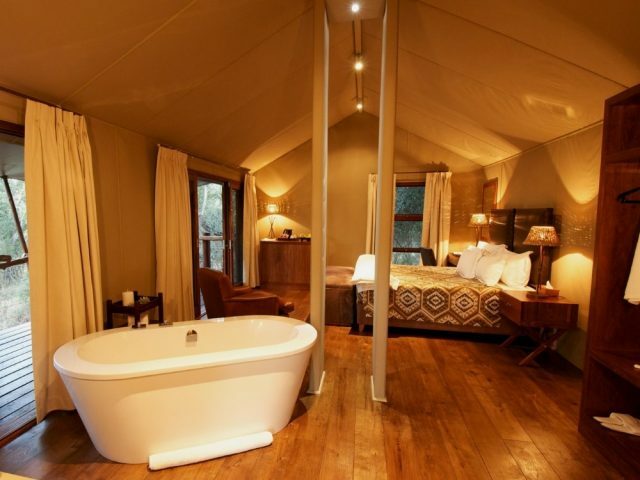 When you talk of traditional tented safari camps, the things that typically spring to mind are dusty green canvas, flickering lanterns, simple furniture with perhaps the odd colonial style décor touch. Well Ngala Tented Camp has taken that old traditional recipe and ripped it up by completely re-imagining what the 21st century tented camp should look like. The result is frankly stunning – modern clean lines, funky furnishings and an imaginative use of colour combine with natural building materials like stone-clad walls and polished wooden decks (and canvas of course!) to create something very special indeed! 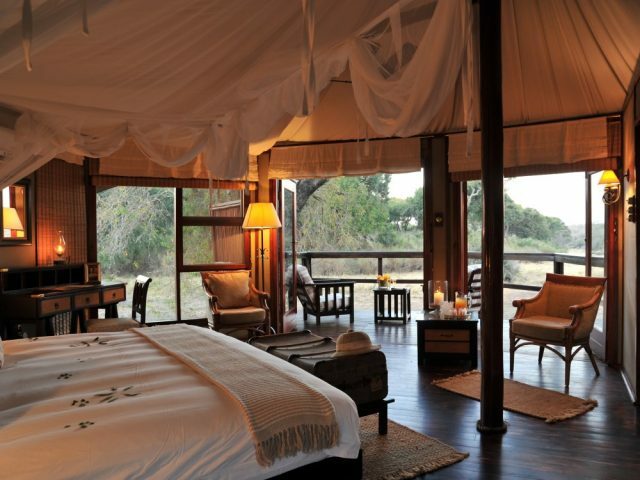 Ngala Tented Camp is located right at the southern boundary of the vast Timbavati reserve. If we were to be critical, its location is probably a little too close to the road leading to the Kruger’s Orpen Gate, so you don’t get that delicious sense of anticipation that usually builds as you drive through a reserve towards the lodge you’re due to stay at (on the plus side though, it does make the lodge quick and easy to get to compared to other lodges in the reserve) However, when you arrive all this is forgotten as you emerge out onto a gorgeous deck with stunning views over the (usually) sandy bed of the Timbavati River. 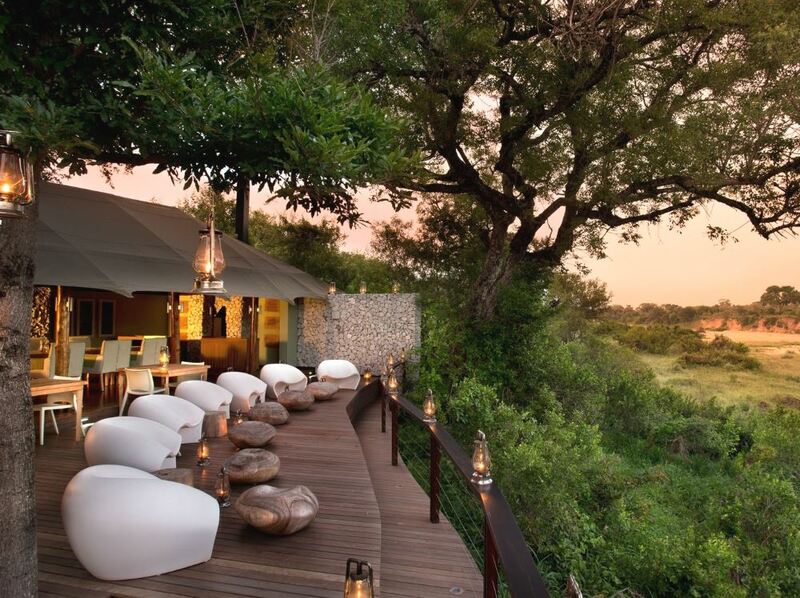 In our opinion the main lodge areas at Ngala Tented Camp are some of the most attractive to be found anywhere. The lines are sleek and modern, the materials warm and organic, the overall effect superbly stylish yet simultaneously very comfortable. The lounge area features lovely polished wood flooring, canvas roofs, comfy overstuffed sofas in the gorgeous green that is the signature of the lodge and a host of contemporary décor touches. Floor to ceiling windows and doors make for stunning views out over the river bed. Sitting on elevated platforms gazing out over the bush and the Timbavati River, Ngala’s nine tented suites bring the romantic wonder and rustic charm of old-age tented camps together with modern, sleek design in a way that adds up to a superbly luxurious yet authentic experience. A massive bed sits at the heart of the room, a spacious and beautifully appointed bathroom found behind a partition wall (the deep free-standing tub is a highlight – a wonderful option for late-evening soaks) and our personal favourite has to be the gorgeous outdoor shower framed by a stone-clad curved wall. Deep brown wooden flooring and the use of the lodge’s signature green on feature walls, curtains and fabric throws echo the natural elements outside, while canvas, gauze screening, and screen windows bring an undeniable feeling of intimacy – of being hidden from the outside world, of complete seclusion. On your private deck meanwhile, you can relax in the embrace of your designer armchair whilst you watch for signs of animals picking their way through the bush. Whilst we raved so far about the lodge itself, the good news continues in terms of the game viewing experience offered here. The Timbavati is recognised as one of the finest Big Five reserves in the country and in particular for its lion population (including being the home of the famous and rare white lions) with big breeding herds of buffalo and elephant also making for memorable sightings. And with Ngala’s thoroughly-trained game rangers and guides, seeing these animals in their natural habitat becomes a daily occurrence. And it’s not just their masterful expert knowledge of the entire eco-system here that impresses, their warmth and friendliness is also typical of andBeyond’s renowned high standards. Another major “plus” is that the lodge is located on an exclusive concession area within the Timbavati, so you’re not sharing the bush with myriad vehicles from other lodges and so under no pressure to leave great sightings. Better yet, you can opt to leave the confines of your 4x4 and take a bush walk or walking safari. These treks on foot (under the guard and care of your professional ranger of course) are, quite simply put, the best way to get up close to the wild residents of the Timbavati reserve. It’s a totally exhilarating not to mention humbling experience to realise how little you know about the bush when you’re faced with the bare facts that every scent, sound and broken twig tells a tale of animal movements. Ngala is one of those uncommon places that offer guests something truly remarkable and unique. Everything – from the in-house chefs’ amazing multi-course meals to the stress-destroying massages in the private spa sala overlooking the riverbank – seems to be honed and crafted to giving you the getaway that you’ll look back on for years to come. Listening to bush stories sitting in the calm of the evening around the fire under the stars, enjoying a romantic dinner for two along the banks of the river - Ngala Tented Camp is the kind of place you spend years trying to find, and a lifetime trying to relive. 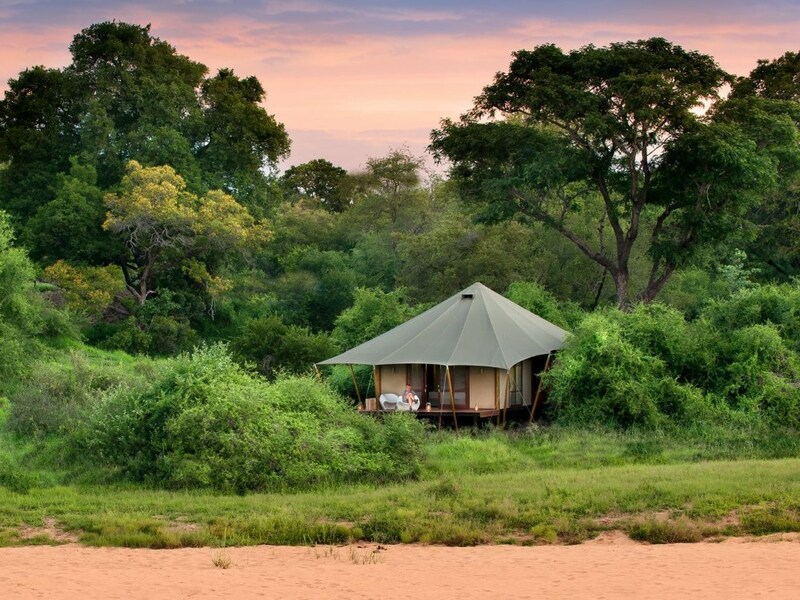 Gorgeous lodge of 12 beautiful tents set in a stunning location overlooking the dry Nhlaralumi river bed and an active waterhole!